The Choice Privileges Signature Card is issued by Barclays Bank Delaware, member FDIC. 1. Offer subject to credit approval. Not everyone will qualify for the Choice Privileges ® Visa Signature® credit card and its benefits. If at the time of your application you do not meet the credit criteria previously established for this offer, or the income you report is insufficient based on your obligations, we may not be able to open an account for you or you may receive a Platinum card. Benefits will vary depending upon the card for which you are approved. Please review the materials provided with the Cardmember Agreement you will receive after account opening. This offer is available to new cardmembers only. For more information about rates, fees, other costs, the reward program rules, and benefits associated with the use of the credit card program, please see the Terms and Conditions. Annual Fee: $0. 0% introductory APR on balance transfers made within 45 days of account opening is applicable for the first 15 billing cycles that immediately follow each balance transfer. This introductory APR offer does not apply to purchases and cash advances. For purchases, and new and outstanding balance transfers after the introductory period, the variable APR is 17.49%, 22.24% or 27.24% depending upon our review of your application and your credit history at account opening. The variable APR for cash advances is 27.49%. The APRs on your account will vary with the market based on the Prime Rate and are subject to change. For more information see the "About the Variable APRs on Your Account" section of the Terms and Conditions The minimum monthly interest charge will be $0.50. Balance transfer fee: 3% (min. $5). Cash advance and cash equivalent fees: 5% (min. $10). Foreign transaction fee: 3%. See Terms and Conditions for more information about the terms of this offer. 2. Please review the Reward Summary for important information about the program benefits and features listed above and the Terms and Conditions for full details about the reward benefits (such as how points are earned), interest rates and account fees and terms for this particular offer before applying. Important Information About The Choice Privileges Rewards Program: Eight thousand (8,000) points can be redeemed for a free night at over 1,000 Choice Hotels or a free night at most Choice Hotels requires more than 8,000 points. Visit choiceprivileges.com for more details regarding the terms of the Choice Privileges Reward Program and redemption levels. Restrictions, taxes and fees apply. Bonus Points: Thirty two thousand (32,000) bonus points will be awarded after at least $1,000 in Net Purchases (that are not later returned or restricted) has been charged to the new account within 90 days of Account opening. Bonus Points will be awarded at the close of the billing statement after the qualifying transaction(s) have posted. 32,000 points can be redeemed for up to 4 free nights at eligible Choice Hotels® locations. Anniversary Bonus Points: Eight thousand (8,000) bonus points will be awarded after spending at least $10,000 in Net Purchases (that are not later returned or rescinded) within each card account anniversary year. A maximum of 8,000 anniversary bonus points can be earned per year regardless of the amount of Net Purchases made. Anniversary Bonus Points will be awarded at the close of the billing statement following your account anniversary. Through your Membership, you will earn 10 points per $1.00 spent on eligible stays at Choice Hotels when the Account is linked to the same Membership. These points will be awarded after your stay is complete and will be posted directly to your Membership account. The additional 5 points will be awarded through Choice Priviliges Visa Signature Account. First, you will earn 2 points for every $1.00 of net Purchases spent. Then, earn 3 points for every $1.00 of Net Purchases spent on eligible stays at Choice Hotels locations purchased with the Account linked to the same Membership. These points will be awarded after your stay is complete and may post on a separate billing statement than the one on which the stay transaction has posted. Earn 2 points for every $1.00 of Net Purchases spent on all other purchases, including non-point eligible Choice Hotel stays. These points will be awarded when the purchase is posted to your Account billing statement. 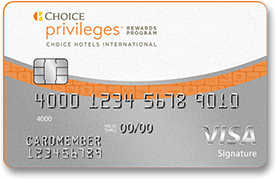 For complete details on eligible hotels that earn points, and the terms of the Choice Priviliges Program please go to choiceprivileges.com. Important Information About Choice Privileges Membership: Please allow 4-6 weeks for points to be awarded into your Choice Privileges rewards account. The Choice Privileges Visa account must be in good standing to maintain Choice Privileges Elite Gold membership status. The Choice Privileges Elite Gold Membership Status and associated benefits are administered by Choice Privileges Rewards. Choice Privileges Terms and Conditions apply. See choiceprivileges.com for details. This offer is intended for persons who are not and have not previously been cardmembers of the Choice Privileges Visa Card program. You understand and agree that, unless Barclays otherwise states, cardmembers are no longer eligible to receive bonuses and/or awards for any new account opened after the initial account is opened. The Choice Privileges®Visa® card is issued by Barclays Bank Delaware (Barclays) pursuant to a license by Visa USA Incorporated. Visa is a registered trademark of Visa USA Incorporated. © 2019 Barclays Bank Delaware, Member FDIC.